The Booth Brothers (L to R): Michael Booth, Ronnie Booth and Paul Lancaster, will perform in Winona Lake, Ind., on Sunday, August 5. 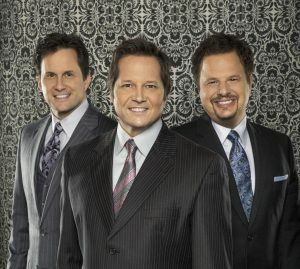 The Booth Brothers, a renowned Southern Gospel group, will perform a free concert on Sunday, Aug. 5, at 7 p.m. The concert is part of the Grace College and Village at Winona Festival of Music and will take place at the Village Amphitheatre on Tabernacle Lawn, 801 Park Ave., Winona Lake, Ind. Tent seating will be provided to the first 350 people. Community members are also invited to bring their own chairs and blankets. The amphitheater will open at 5:45 p.m. for first-come, first-served seating. Ronnie and Michael Booth started performing gospel music when they were children and traveling with their father, Ron Booth, Sr. Together with Paul Lancaster, the trio has won many awards, including Song of the Year, Album of the Year, Trio of the Year, and Best Live Performers. They perform gospel music all over the country and beyond, ministering to their audience and offering encouragement and hope through word and song. Other upcoming Festival of Music concerts include the contemporary Christian concert featuring Sarah Groves, Andrew Peterson, and Over the Rhine on August 11. Visit grace.edu/musicfestival/ for more information.